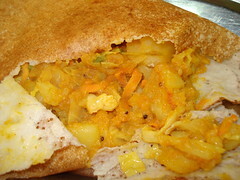 Dosai Masala, originally uploaded by Camemberu. Yes, due to my baby girl's surgery and checkups, I've become quite familiar with KK Hospital's cafeteria food court (yet another one belonging to the ubiquitous Kopitiam franchise). Food at KKH is very lamentable, according to some insiders in the medical industry. Overpriced (Delifrance), unhealthy (McDonald's) and tasteless (Kopitiam). Most of the staff escape to nearby Tekka market. There are a few tolerable stalls within Kopitiam though. The Indian stall serves a fairly decent mee goreng, Indian rojak (the tasty, piping hot peanut sauce saves the semi-cold pieces from disaster!) and briyani. 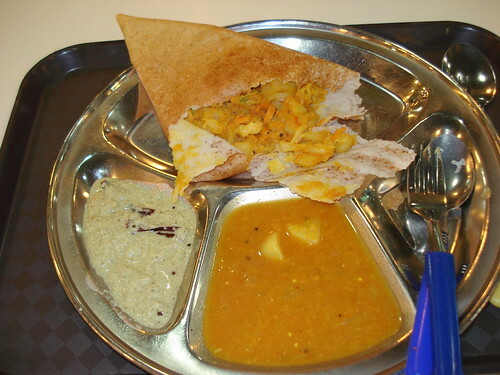 This morning, I ventured to try the dosai masala. It wasn't without a good amount of trepidation though, because you can never be sure they can score well in so many dishes. It turned out all right. The masala filling was tastier than I've had in some places. The only downside was that it seemed a bit cold - in fact, it made the freshly made dosai somewhat cold in the centre and only warm at the outer corners. Despite that, we still finished all of it. Didn't touch the dhal curry much but we pretty much swiped clean the minty coconut chutney. Makes for a very filling breakfast at S$1.50.